Thermal pool - water always 30 degrees! 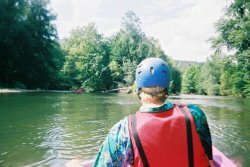 Canoe down the River Aude! 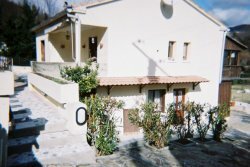 The villa is at the edge of Rennes les Bains, a charming village one hour�s drive south of Carcassonne and one and a half hours west of Perpignan. Rennes stradles the Sals river and is a thermal village, with hot springs feeding into an open-air public swimming pool (30 degrees) with jacuzzi and health centre. The little village square has music and dancing on summer evenings. It accommodates some market stalls, and there are small shops for essentials and a supermarket at Couiza, ten minutes drive away. There are three restaurants, a bar (sometimes with live music) and an art gallery. The house, built 40 years ago, is on two levels. On the main level is the kitchen (modern, fully equipped), the dining room, the lounge leading to the sun lounge, the main bedroom (sleeps two) leading to a little office (could sleep one child), and the bathroom/toilet. The sun lounge and office both open onto the veranda and overlook the huge garden and the wooded hills beyond. There is a spiral staircase to the downstairs apartment which has its own independent access. Its first room has two sofabeds (could sleep four) and a fridge and oven. The second room has a double bed, and leads to a shower and toilet. Also on this level is a large garage, with large freezer, and �cave� for keeping wine. Linen and towels are provided. There is a radio/CD player but no TV or internet. The 2000 square metre garden is fully enclosed and a lockable gate leads down to the small Sals river, which continues through the village. There are fabulous walks in all directions. A tennis court and boules pitch are very close to the house, and horse riding, canoeing and ballooning all within easy reach. This is Cathar country, home of the breakaway Christian sect which Rome crushed in the thirteenth century. You will see spectacular Cathar castles high on rocky outcrops, truly beautiful French villages, acres of vineyards, and amazing river gorges. 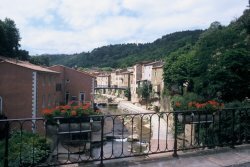 Within a day�s drive is Toulouse, Marseilles, Lourdes, Andorra and Barcelona. You will reach a Mediterranean beach in just over an hour. You will probably know of the legends surrounding Rennes le Chateau (Da Vinci Code etc)... it is a few kilometers away. You are also in one of the best wine producing areas of France.